MOSTYN, Wales UK proudly presents the first solo exhibition in a British institution by Marinella Senatore. The exhibition will present a selection of the artist’s work from 2009 to today, in a renewed form of installation which will enable visitor participation and active engagement. A special focus will be dedicated to The School of Narrative Dance, an ongoing, touring project founded by the artist in 2013 which has received wide acclaim from the public in over ten countries around the world. For the first time it will also present, in its original idea, RE:VERB—a multi-layered work consisting of seven videos intended for television broadcast, made with the people of Llandudno during the artist’s residency in North Wales in 2015. This work was commissioned by CALL, and made possible by the collaborative initiative and financial support of the Arts Council Wales Ideas:People:Places grant and Mostyn Estates Ltd. The exhibition is accompanied by an Open Call for contributions to ESTMAN RADIO, an ongoing “self-service” online radio station which takes up residence in MOSTYN’s Gallery 2. In addition, Marinella Senatore’s video piece The School of Narrative Dance will be showing concurrently on a media wall in Milan’s Corso Como 15 from May 20 until 31, as part of a joint partnership between MOSTYN and Poincaré Investment Ltd. The partnership also sees the presentation of a new video work by ciriaca + erre from May 1 until 19. The exhibition, curated by Alfredo Cramerotti (Director, MOSTYN) and related public programme is supported by CALL and Poincaré Investments Ltd. The School of Art, Science & Technical Classes takes as its point of departure the use of MOSTYN’s building as an art gallery and educational establishment from 1903 to 1912. Some of the subjects on offer included life drawing, light & shade drawing, brushwork, geometrical drawing, woodcarving, metalwork, dressmaking, elocution, music, French and shorthand. The classes were supplemented by lectures on associated subjects. Some 100 years on, new “classes” have been curated with solo exhibitions by Camille Henrot, FORT and Meirion Ginsberg. An additional room will survey the time of the original art school and its links to the present, along with a history of a number of local schools. The exhibition is part of the “History Series” at MOSTYN and is the seventh exhibition in the series. The three artists have been chosen for their international relevance and mastery, or emergence and promise, in the respective disciplines of the classes, which are “brush drawing” (Camille Henrot), “metalwork” (FORT) and “light and shade” (Meirion Ginsberg). Arguably the original terms are outdated and have been replaced by new definitions, or have been co-opted by a more general term “Contemporary Art.” Paradoxically, however, they offer new ways of seeing and interpreting the work in display—in the same way that the “History Series” uses the past to establish new pathways for understanding society today. This exhibition is curated by Adam Carr (Visual Arts Programme Curator, MOSTYN). The historical presentation is brought together in collaboration with Jane Matthews (Engagement Manager/Research MOSTYN) and Richard Cynan Jones (Operations and Facilities/Research, MOSTYN). Gallery 6 is dedicated to presenting the work of young and emerging artists, all of whom are yet to have a solo exhibition in an institutional setting—nationally or internationally. The final exhibition of the programme is by Sïan Rees Astley, born 1992 and based on Anglesey, and a recent graduate from Coleg Menai in Bangor, North Wales. Sïan Rees Astley’s work makes wide use of everyday materials, often those produced for the domestic space. Her work positions the process of its making at its core, and heightens the sense of time spent working with the materials. A key element of the work is repetition, used throughout, and which sometimes renders the materials used beyond recognition, only apparent by way of the work’s captions. This exhibition, curated by Adam Carr (Visual Arts Programme Curator, MOSTYN), will present new work made in response to the space. Located in Llandudno, North Wales (UK), MOSTYN is the leading publicly funded contemporary visual art centre in Wales, serving as a forum for the presentation and discussion of contemporary life through international contemporary art and curatorial practice. Through exhibitions, learning programmes, lectures, symposia and publications, MOSTYN plays an active role in discussing contemporary culture in Wales, the UK, and beyond. To be kept up to date with MOSTYN’s new programme, please subscribe to our mailing list by emailing lin@mostyn.org. 38 artists selected from open call submission. The winner of the £10,000 prize will be announced on the night. Participating artists for MOSTYN Open 19 are Caroline Allen, Mark Beldan, Hannah Birkett, Jorge Lizalde Cano, Ciriaca + Erre, Briony Clarke, Teresa Cos, Maria Ana Vasco Costa, Fiona Curran, Peter Doubleday, Mark Doyle, Alex Duncan, Catrin Llwyd, Rosie Farey, Carlos Noronha Feio, Rebecca Gould, Shreepad Joglekar, Gethin Wyn Jones, Justyna Kabala, Debbie Locke & Sara Dudman, Robert Lye, McGilvary/White, Lindsey Mendick, Fay Nicolson, Timea Anita Oravecz, David Paddy, Simon Parish, Alice Pedroletti, Jonathan Phillips, Susan Phillips, Serena Porrati, Steph Shipley, Tim Simmons, Kristian Smith, Matthew Smith, Catrine Val, Dominic Watson, Ben Woodeson. 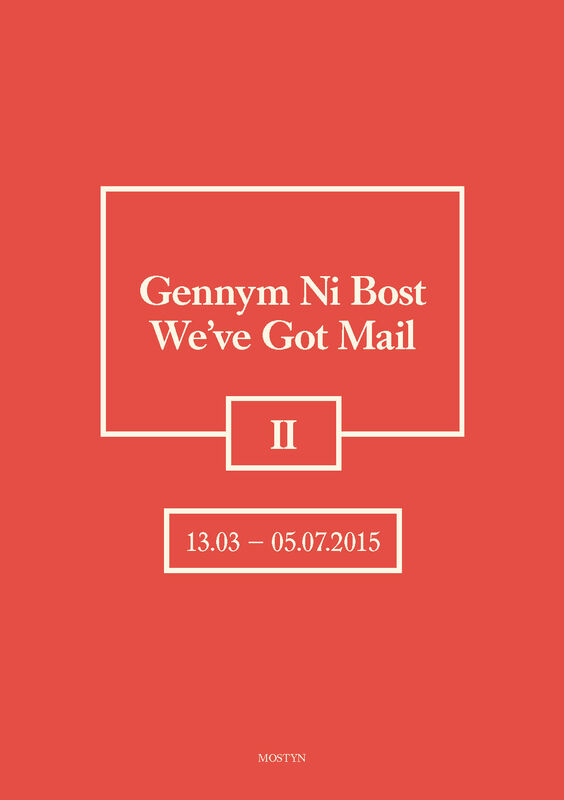 The fourth in a series that examines the MOSTYN building’s rich heritage, We’ve Got Mail II continues the gallery’s response to its former use as a postal sorting office. In 2014 We’ve Got Mail I presented a history of the Royal Mail alongside artworks by contemporary artists. This second show looks specifically at the history of the postcard in the town of Llandudno and presents a selection of classic examples of the use of the postcard in the visual arts. The 8. Furla Prize 2011 evolved over its eight editions and is now recognised as the ultimate Italian prize in support of young Italian contemporary artists, with a format focusing on education and the production of new works. The patron artist of the 8. Furla Prize 2011 is Christian Boltanski, who created the image and motto of this edition, Pleure qui peut, rit qui vet, a sort of oxymoron for the 5 finalists. The artists are: Alis/Filliol – Andrea Respino (Cuneo, 1976) and Davide Gennarino (Torino, 1979), nominated by Simone Menegoi and Marianne Lanavère; Francesco Arena (Brindisi, 1978), nominated by Vincenzo De Bellis and Philippe Pirotte; Rossella Biscotti (Bari, 1978), nominated by Cecilia Canziani and Vincent Honoré; Matteo Rubbi (Bergamo, 1980), nominated by Lorenzo Bruni and Carson Chan; Marinella Senatore (Salerno, 1977), nominated by Alfredo Cramerotti and Emily Pethick. The 5 finalists projects and a selection of artists’ works will be presented in Bologna at Palazzo Pepoli, in the exhibition Pleur qui peut, rit qui veut – a collaboration with Fondazione Furla and Fondazione Carisbo (29 January – 6 February 2011). An international jury consisting of Christian Boltanski, Stefano Chiodi (art historian and critic), Vít Havránek (curator), Jörg Heiser (co-editor of frieze magazine), Miguel Von Hafe Pérez (director of the CGAC Centro Galego de Arte Contemporáneo in Santiago de Compostela, Spain) will choose the winner, to be announced on January 28, 2011 in Bologna, during the opening of the exhibition. 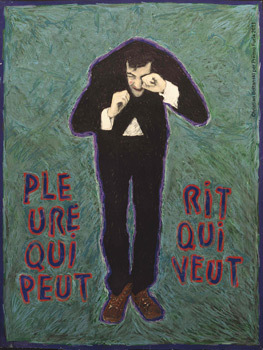 In addition to the opportunity to study and work abroad in an artist’s residency program (at Arizona State University Art Museum) the winner will also be invited to create a work financed by the Fondazione Furla and intended to be showing for a public exhibition thanks to a special agreement with the MAMbo – Museum of Modern Art of Bologna. The work of the winning project will premiere at the Fondazione Querini Stampalia in Venice in June 2011, during the 54 Biennale of Visual Arts. The Furla Prize, created by Chiara Bertola, is today organised and promoted by Fondazione Furla, Fondazione Carisbo, Fondazione Querini Stampalia, and MAMbo – Museum of Modern Art of Bologna, with the support of Carisbo S.p.A. and with the collaboration of Viafarini and Arte Fiera. Alis/Filliol, Francesco Arena, Rossella Biscotti, Matteo Rubbi, Marinella Senatore. Il Premio Furla giunge all’ottava edizione con un padrino di eccezione Christian Boltanski, ideatore dell’ immagine guida e del motto di questa edizione Pleur qui peut, rit qui veut. I cinque artisti finalisti sono: Alis/Filliol – Andrea Respino e Davide Gennarino, nominati da Simone Menegoi e Marianne Lanavère; Francesco Arena, nominato da Vincenzo De Bellis e Philippe Pirotte; Rossella Biscotti, nominata da Cecilia Canziani e Vincent Honoré; Matteo Rubbi, nominato da Lorenzo Bruni e Carson Chan; Marinella Senatore, nominata da Alfredo Cramerotti ed Emily Pethick. Il vincitore sara’ annunciato durante l’inaugurazione della mostra Pleure qui peut, rit qui veut – una collaborazione tra Fondazione Carisbo e Fondazione Furla: esposti nella splendida cornice di Palazzo Pepoli i progetti dei finalisti e una selezione delle loro opere dal 29 gennaio al 6 febbraio 2011. Ad Arte Fiera Spazio Art Talks venerdi 28 gennaio ore 11.30 – 13.30 una tavola rotonda con i curatori e gli artisti. Arte Fiera e il MAMbo daranno inoltre visibilità ai progetti in un’area dedicata all’interno dei loro spazi. Il premio consiste in una residenza d’artista all’estero organizzata in collaborazione con Arizona State University Art Museum (Tempe, USA) e nella realizzazione del progetto presentato. L’opera sarà esposta in anteprima alla Fondazione Querini Stampalia a Venezia a giugno 2011, durante la 54. Biennale di Arti Visive, e concessa poi in comodato al MAMbo – Museo d’Arte Moderna di Bologna. Il Premio Furla ideato nel 2000 da Chiara Bertola a Venezia alla Fondazione Querini Stampalia, è oggi organizzato e promosso da Fondazione Furla, Fondazione Carisbo, Fondazione Querini Stampalia, MAMbo – Museo d’Arte Moderna di Bologna, con il supporto di Carisbo S.p.A e con la collaborazione di Viafarini e Arte Fiera. A cura di Lorenzo Bruni, Cecilia Canziani, Alfredo Cramerotti, Vincenzo de Bellis, Simone Menegoi. L’attesa era forte, ed in effetti decisamente motivata, con l’evento che non ha tradito le aspettative. A Milano si presentava l’ottava edizione del Premio Furla, che ha calato subito un asso in grado di sbaragliare la partita: Christian Boltanski, che sarà l’artista – padrino e l’ideatore dell’immagine grafica e del titolo, Pleur qui peut, rit qui veut. “Una sorta di ossimoro – spiega Chiara Bertola, curatrice del premio – che apre la strada ai finalisti per l’ideazione dei loro progetti”. E chi sono i cinque artisti finalisti? Alis/Filliol – Andrea Respino e Davide Gennarino, nominati da Simone Menegoi e Marianne Lanavère; Francesco Arena, nominato da Vincenzo De Bellis e Philippe Pirotte; Rossella Biscotti, nominata da Cecilia Canziani e Vincent Honoré; Matteo Rubbi, nominato da Lorenzo Bruni e Carson Chan; Marinella Senatore, nominata da Alfredo Cramerotti ed Emily Pethick. Una giuria internazionale composta dallo stesso Christian Boltanski, da Stefano Chiodi (storico e critico d’arte), Vit Havranek (curatore e project leader del team curatoriale tranzit.org), Jörg Heiser (co-editor di Frieze Magazine e guest professor all’Art University di Linz, Austria), Miguel Von Hafe Pérez (direttore del Centro Galego de Arte Contemporáneo di Santiago de Compostela, Spagna) sceglierà il vincitore, che sarà annunciato il 28 gennaio 2011 a Bologna. Il vincitore sarà invitato a realizzare un’opera finanziata dalla Fondazione Furla e destinata alla fruizione pubblica attraverso la concessione in comodato al MAMbo – Museo d’Arte Moderna di Bologna. L’opera del progetto vincitore sarà presentata in anteprima presso la Fondazione Querini Stampalia a Venezia nel giugno 2011, in concomitanza con la 54. Biennale di Arti Visive. “Con questa ottava edizione che segna la chiusura del primo decennio del Premio Furla – ha detto Giovanna Furlanetto, Presidente della Fondazione Furla -, alla Fondazione Furla si affianca per il futuro la Fondazione Carisbo come partner istituzionale, che ha messo a disposizione per la mostra dei cinque artisti finalisti uno dei suoi spazi più prestigiosi, Palazzo Pepoli a Bologna, recentemente restaurato”.